Once the project was officially launched in 1998 remarkable progress was made. From the start it was agreed that the creation of a new power bogie and boiler to replace the unit scrapped on 1934, would be given priority. 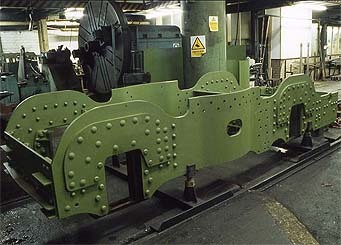 This phase of the project was to produce a self contained power bogie similar to the original GWR one pictured (left). The first milestone was reached in November 2000 when the mainframe for the brand new power bogie unit was erected. 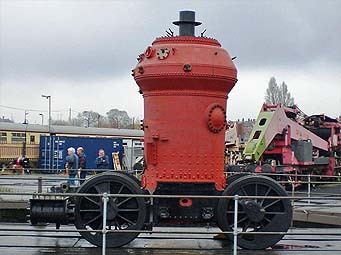 This crucial phase of the project was completed under the supervision of the Birmingham Railway Museum's engineer Bob Meanley at Tyseley Locomotive Works, where the bogie could be viewed from the public gallery. While the frame was being assembled, several other important components including the motion brackets, underkeeps, horn guides and guard irons were also delivered and these have gradually been machined and positioned on the mainframes. 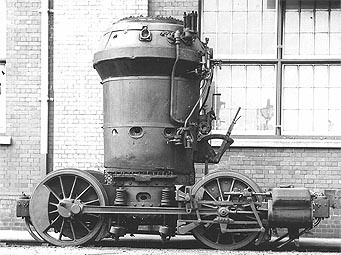 The railmotor's 4ft 0in driving wheels were cast at the same time as the wheels for the 'Saint' rebuild No. 2999 Lady of Legend. 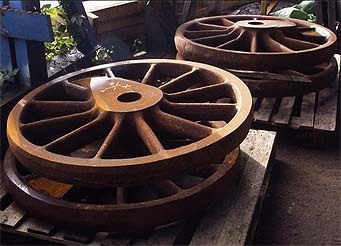 In February 2003 the two new driving wheelsets, including the return crank assembly, were completed by Dowding & Mills at Weedon and delivered to the Tyseley Locomotive Works. The four main springs were manufactured by a firm in Sheffield and the remaining spring gear arrived by air freight from Australia at Christmas 2003 having been made by Lovells Springs of Paramatta, Sydney. These joined the power bogie frame and the four axle boxes, which were cast in 2002, and permitted the assembly of a rolling chassis for the first time. Thanks to a highly competitive foundry quote, both cylinder blocks for the railmotor were cast in the first half of 2001, together with the steam chest and front and back cylinder covers. 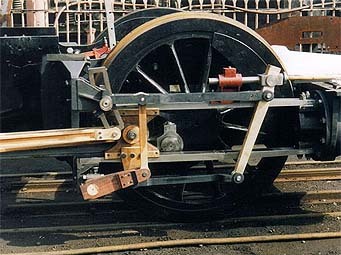 The right hand cylinder assembly was fully machined and fitted to the chassis first to enable measurements to be taken in connection with design of the motion. In addition the motion brackets were fitted on both sides. 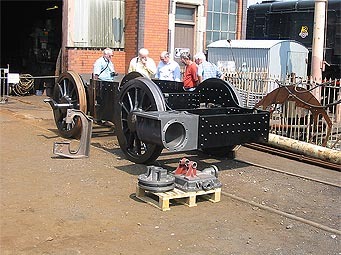 The left hand cylinder block was subsequently machined and fitted to the power bogie, together with both sets of back cylinder cover and slidebars so that the bogie weight was evenly matched. The Great Western Society had a good cross section of power-bogie drawings in its possession, although when it came to the motion what had survived was fairly minimal. However, we were fortunate that the Vale of Rheidol tank engines have similar motion, although with slightly different dimensions, from which Mike Rudge and his team of draughtsmen have been able to make new drawings. Unfortunately, despite Mike's best efforts, he could not get a match for certain dimensions. Some items can be considered fixed, such as the cylinder blocks, slidebars and the coupling rods, so these were duly ordered. Four slidebar forgings were ordered, two of which were machined and fitted, together with the motion plate and both coupling rods. Due to the lack of original detailed drawings of the motion; connecting rods, eccentric rods, radius rods, valve and piston rod assembly, combination lever union link and reversing shaft were mocked up in timber, by Roger Paddison, to ensure perfect alignment and operation before these items were finally manufactured. 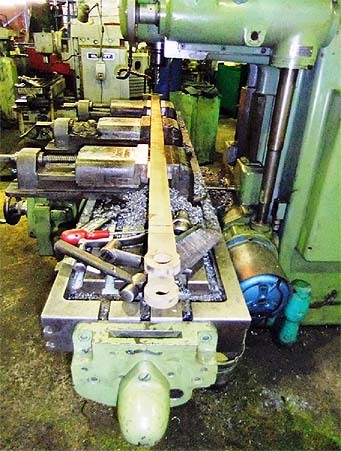 These wooden components enabled us to align the frame, wheelsets and motion so that exact dimensions could be confirmed before ordering the remaining motion parts, including the connecting rods. 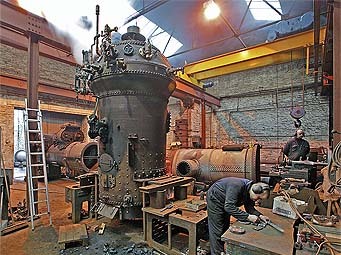 Having established the correct dimensions for the remaining items of motion the bogie and boiler were moved from Tyseley to the Society’s Didcot Depot in March 2008 and put on display in the Engine Shed while work proceeded on forging and machining all the remaining components. In January 2009 the assembly was moved to The Llangollen Railway engineering workshops to be installed in the coach underframe and for completion of final machining of the motion, together with assembly, adjustment of the valve timing and testing. At the start of the project it had been planned to make construction of a new boiler the last job - partly to maximise its working life before overhaul and partly because initial enquiries suggested the price would be £80 - 90,000. However, Israel Newton of Bradford - who recently made a boiler for the Firefly Trust - has quoted £57,000 for the railmotor boiler with a copper firebox, which has been specified in preference to a steel firebox to give the boiler a longer life. 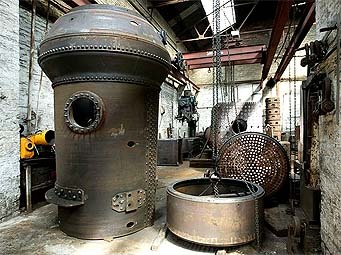 Although earlier acquisition of the boiler means it will have to be retubed sooner in its working life, the GWS feels that the very large initial saving and the benefit brought by having the boiler in situ during the complex task of making and fitting all the pipework more than justifies this. The intention was to unite the boiler with the rolling chassis before we proceed to undertake the rebuilding of the coach body. To some this may seem the wrong way around, however it is important that we know the exact dimensions of everything which will be enclosed within the body shell before we undertake the rebuild to avoid any later embarrassments should it be found that things do not quite fit. Furthermore our experience with No.6023, where we undertook a straight copy of the pipe work off King George V, found many time consuming alterations were required afterwards. Fitting the new boiler for Fire Fly suggests that connecting all the pipe work and fittings will be a time consuming job and we need a firm physical base to start from rather than theoretical dimensions. 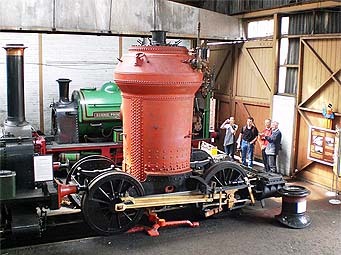 The Boiler shell and all the fittings were completed by the end of 2005, and with the new ash pan and grate and the new chimney and the smokebox pipework manufactured, the boiler underwent a successful hydraulic test in May 2006. Once all the fittings were attached, a successful steam test took place on 11th January 2007, after which the boiler was moved to Tyseley to be mounted on the bogie chassis. The total cost of the boiler and all its fittings and peripherals is estimated to have cost nearly £100,000 of which about 25% was provided via a grant from the Esmee Fairbairn Foundation for which we are most grateful. On Tuesday the 27th December 2007 there was a sight at Tyseley Locomotive Works that had not been seen since 1935 - a Railmotor boiler sitting in the frames of a power bogie. On 11th March 2008 the bogie and boiler assembly arrived at Didcot for display during the summer season. This offered the only opportunity to view the assembly in detail before it was fitted to the coach. Additional information on the power bogie and boiler can be found in the Archive News sections.